Beeline broking is a unique company having both Full Service broker & Discount broker tag. Lets have detailes understanding of Beeline Broking Demat Account, Beeline Brokerage Charges, Beeline Broking Trading Platforms & other features. Beeline broking limited is a mix of full service broker and discount broker. They offer trading across different asset class and add on services. These includes equity SEP (Systematic Equity plan), SME listing & planning, research and market analysis, technical and fundamental analysis, tips and recommendations and many more. The broker is Ahmedabad based, promoters have a long experience of the market which is quite helpful for budding traders and investors. Beeline Broking lets you trade online in arena like equity delivery, intra-day, derivatives, currency ($, yen, sterling and euros), commodity by having membership of NSE, BSE, MCX, NCDEX through their online trading platforms. Trading in commodity Segment is offered by Beeline Commodities Pvt Ltd. Beeline is a depository participant. Demat account opening onetime fee is Rs 876 with free AMC. Beeline has tie up with NSDL, a repository that has all your insurance policies in demat form. The broker helps you create an e-insurance account (e-IA) absolutely free of cost. You can buy as many insurance policies under the same demat account. You can also pay your premiums, view your portfolio and make amendments to your policy online, which is really unique. If we talk about brokerage, then Beeline offers both the options. Per order brokerage and percentage based brokerage. They have a brokerage bidding page where you can choose your own lowest brokerage for different segments, which is again rare feature among broker. Flat fee brokerage is fixed at Rs 18 per executed order in equity delivery, equity derivative, currency and commodity future segment, which we find to be quite competitive. Beeline has a daily rewarding program where they reward participant with e-vouchers for predicting the daily closing of indices future, currency future and commodity future of the current month making it fun and adventurous too. The participant who makes the nearest predictions on either side of the close is the winner. 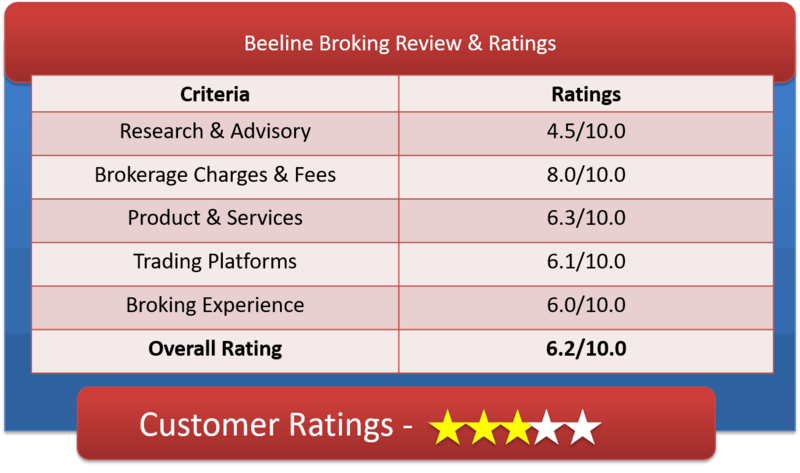 Beeline also value the contribution by their client and based on their contribution in terms of Client referral, Sub broker/ Associate Program/ Remisier referral, Participation in a survey/giving us feedback & Brokerage generated which helps in adding client base. Based on your contribution Beeline assign reward points to their clients. Usually 2% of the average monthly brokerage gets converted into reward points. The reward points that their clients accumulate can be redeemed on a monthly or quarterly basis. For more details, log on to their website beelinebroking.com. On Customer Service, Beeline serves customer through email, call and live chat. Beeline have only two branch offices, one in Ahmedabad and another one at Gandhinagar. Beeline offers per order brokerage and percentage based brokerage. Per order is at Rs 18 per executed order for all the segments but percentage based brokerage can be chosen using brokerage bidding page online. The brokerage of per order of Rs 18 is quite acceptable. It is although lower than Zerodha, UpStoxs,SAMCO, Fyers (@ Rs 20), higher then ProStocks and TradeSmartOnline (@ Rs 15), SASOnline, RKGlobal (@ Rs 9), 5Paisa and MyValueTrade (@ Rs 10). The percentage brokerage of Beeline is variable depending upon bidding and negotiation with the broker. The maximum brokerage offered is 0.25% & 0.02% (for equity delivery, equity intraday respectively) and future as well, Rs 50 per lot for options, 0.01% for commodity and currency future and Rs 15 per lot for currency options. The percentage brokerage is at the lower side in the industry. How to Open Beeline Broking Demat Account? Beeline Broking Ltd Customer Service Executive will call you back if you drop your phone number to them. Why Open Beeline Demat Account? Services of Relationship Managers and Research Analysts are exceptional. Recommendations & tips through direct mailers which has good positive conversion. Both percentage brokerage and per order brokerage options available. Trading facility available across asset class on NSE, BSE, MCX and NCDEX. Facility to investment in ETFs and bonds. Assistance to companies for listing as SMEs. Beeline provides trading platforms for all types of devices & browsers. Let have detailed understanding of the same. Out of two trading platforms offered by Beeline, one is absolutely free. The broker offers service little more than discount broker and they work on innovative tools and platform. The broker provide tips for stocks, has relationship managers but doesn’t provide any research reports and analysis. Overall an average broker with a potential to offer more in future. So bargain here as much as you can. Beeline Loyalty Rewards Program. Feels like double bonanza. Referral Program earnings. You can earn 10% on revenue generated by your referral on first layer and 5% in second layer. Systematic Equity Plan (SEP), which is a good mean to create wealth over long term. Equity, Commodity and currency trading all comes in one. IVRS facilities for back-office and balance confirmation.